Originally published in the US as "Anna's Book" this Ruth Rendell novel provides an exceptional portrait of three generations of woman in London from 1905 until the mid-sixties. Deservedly a modern classic, the reading perfectly matches and enhances the text. Ms Walter subtly differentiates each of the three women and finds every moment of humor, frustration and suspense as the diaries are used to solve a sixty year old mystery. Leisurely paced this is a novel more about character than event and an extraordinary listening experience. It is 1905 and Asta Westerby and her husband Rasmus have just moved to England from Denmark with their two boys, with a third child on the way, which Asta dearly hopes will be a girl. 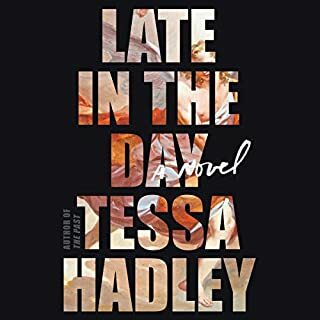 Asta tells her story through a series of journals, in which she writes sporadically about various events, describing her family life; her marriage, her children, her maid, which make up her whole universe. Asta has an independent spirit and was not necessarily cut out to be a wife and mother, but she accepts her lot because other alternatives don't seem appealing or feasible. But this is only part of the story, because the other part takes place in a contemporary setting, sometime in the 90s, which is when this book was published. Asta's granddaughter Ann has come into her inheritance now that her aunt Swanny has passed away. Swanny was Asta's favourite child and having discovered her mother's journals after her passing, decided to have them translated and published with tremendous success. Now Ann is responsible for the manuscripts and intends to continue publishing additional volumes. But there are various mysteries to be found in what have become historical artifacts. Swanny was never able to learn the truth about her true identity after receiving an anonymous letter telling her she was not in fact Asta's child, something which Asta herself refused to confirm on way or another. Is the answer to be found in one of the volumes? But there are also mentions about a horrible crime which was a sensation in it's time, with Alfred Roper accused of murdering his wife and the disappearance of their young toddler Lizzie. Was Swanny that Roper child? And if not, what happened to Lizzie? These are mysteries which Ann and a friend producing a movie about the murder mystery are out to solve. The premise of this novel seemed very interesting, but I found the story very confusing, with two seemingly completely separate stories and families that had nothing in common somehow connected in a way which is only revealed at the very end. Perhaps this is a story which benefits from a second reading. Then again, perhaps my own mind is too muddled to understand a plot which doesn't follow a familiar narrative style. I also kept wondering why Asta's journals had become such hugely successful books, as they didn't seem to make for such gripping reading on their own. Don't let my confused ramblings about this book influence you though, because it seems to have met with a lot of appreciation with other readers. Where does Asta's Book rank among all the audiobooks you?? ?ve listened to so far? I loved this audiobook - definitely one of my favorites so far. Ruth Rendell/Barbara Vine is a superb mystery writer. I've listened to, or read, everything she's ever written. What was one of the most memorable moments of Asta's Book? The most memorable parts of the book for me were in the early chapters where Asta writes in her diary of her early life after immigrating from Denmark to London with her husband, the birth of their children, of Swanny's place in the family, and their rise from near poverty to a life of upper class wealth. Asta herself was a contradiction: tough and cold sometimes, and yet warm and motherly too. She was a survivor first of all and you get the feeling that she would endure anything to get what she wanted. The psychological makeup and interraction between Rendell's characters are what makes her stuff so good. What does Harriet Walter bring to the story that you wouldn?? ?t experience if you just read the book? Harriet Walter brought life to the characters with her scandinavian accent and superb narration. There's nothing worse for an audiobook experience than a bad narrator or better than a good one. I loved it - from the first word to the last. I looked forward to my long commutes so that I could listen to the book without interruption. Ruth Rendell is a great modern novelest, especially when she writes as Barbara Vine. This one is less weird but much more complex than most, and the main character is fascinating. Would you listen to Asta's Book again? Why? Absolutely. Harriet Walter's reading is so extraordinarily good, so convincing, I would listen to the book again just to appreciate it all over again. The story is generational, and told from the points of view of three women in the same family over the course of a century. All the characters are compelling, and Walter makes them all distinct so that they all draw you in. What does Harriet Walter bring to the story that you wouldn’t experience if you just read the book? First of all, since Asta's character is originally from Denmark, it's important that the reader be able to do a convincing Danish accent for large segments of the book, because her background is so much a part of Asta's character, and the themes of immigrants, changing identities and self-definition and re-definition are at the core of the novel. Walter produces these different voices, accents and characters with seeming ease, and this is saying quite a lot, because there are sections here and there in which she must actually speak a few lines in Danish. I don't know whether Walter actually speaks the language, but even if she was only well coached to be able to deliver the requisite lines, it was very convincing. But more generally speaking, the quality that Walter brings to her reading is a sort of unhurried thoughtfulness that pervades every line. You never feel her either rushing or pushing or bringing herself forward in the performance. Rather, she uses her beautiful, soft-spoken voice to give the characters life. Except, of course, when a character is brusque, or tough or some other quality that requires vocal strength or harshness, which Walter then also delivers. One of her funnier characterizations (among many fine ones) is that of Lisa, a rather vulgar young American girl. Often British actors over-simplify American accents, over-emphasizing "r"s and flat "a"s and not really getting the vowels sounds right, or being specific enough about our regional accents. Walter does NOT fall into this trap. Her Lisa was, again, utterly convincing, and I could not even recognize Walter's own voice in her portrayal. Rather than make me laugh or cry, the book kept me enthralled and I couldn't put it down; I just had to listen to it over the better part of two days straight. 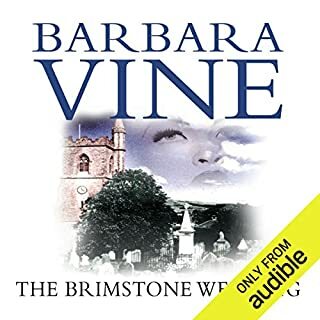 None of the characters are particularly sentimental; this is Barbara Vine, after all. Well, obviously, I think if anyone who likes psychological mystery is really going to enjoy this book. 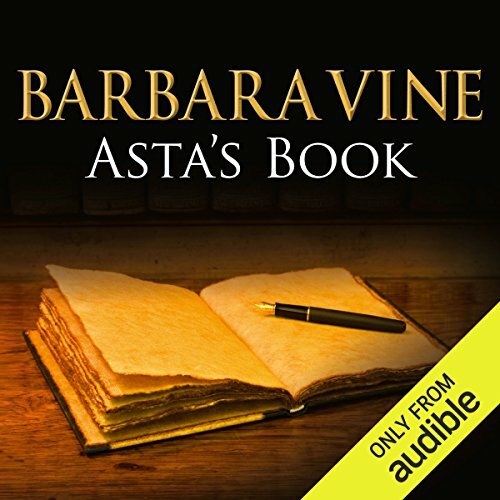 In Asta's Book, Barbara Vine finds a perfect interpreter in Harriet Walter. Yes. Even though you know the ending there are still layers not captured in the first listening. The intrigue, the complex layers and the number of stories within a story. What about Harriet Walter’s performance did you like? Excellent reader. She really became part of the story. Twists and turns to keep you on the edge of your seat. So fantastic. So rich. So complicated. And thankfully, I didn't remember a thing! It's a little difficult to read Vine in this manner, as she takes her time clueing you into who the characters are, what they're on about, how they're related to one another, and you can't go back and skim. (Unless you take the book out of the library, as I did, but that way lies madness.) It eventually all becomes clear. And it's riveting. I'm sure some people will think this is slow, but ignore them. This is what audio reading is all about. I'm a big fan of Ruth Rendell/Barbara Vine,so I was disappointed with this offering. Part of the story is intriguing and holds one's interest, but a lot is slow and boring.I really don't think that diary would be a big seller.Like all Rendell books it is atmospheric and unforgettable. The storyline of this book is complex and, at times, a bit hard to follow. I found myself going back over chapters at several points. Admittedly, this partly due to the fact that I like listening to Audible as I fall asleep. But it was also b/c of the way in which the story unfolds. This might be annoying in some books, but it completely works in this one, as the main "mystery" of the book is being very carefully unwrapped through the eyes of a few different characters. The three central characters are women, and they were really well developed by the author. The narrator adds so much to the character development --- I want to listen to other stories she had narrated! The ONLY reason I did not assign five stars is that the storyline bogged down a bit midway through the book. If you find you have the same experience, keep going! Well worth the read/listen. Be forewarned that this is not a mystery story in the traditional sense. If you like strong and interesting female characters and the atmosphere of a haunting mystery (rather than only the usual plot line of a standard mystery), you likely will love this book. 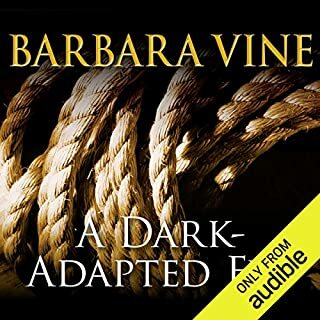 I still haven't figured out why I love Barbara VIne's writing so much and have been so disappointed in Ruth Rendell's books, but I'll take all the Barbara Vine I can. This was another winner - not as good as A Dark Adapted Eye, but still terrific in it's own way. It's a combination of family secrets and generational differences, laid out in a compare-and-contrast fashion through the interpretation and reading of the decades-long journal writing of the protagonist's grandmother. 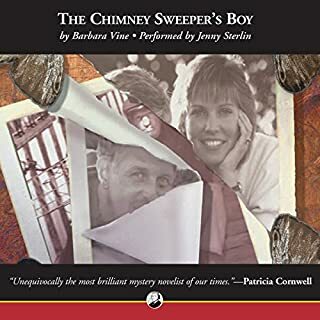 The book, of which the first part was published as a best-seller before the timeline of this novel, leads the protagonist to discovering (and uncovering some) family secrets, as well as re-establishing some long-lost family connections. If you are not a speaker of danish and not aware, as i was not, that the pronunciation is not correct, then the delivery of this captivating story is near perfect. 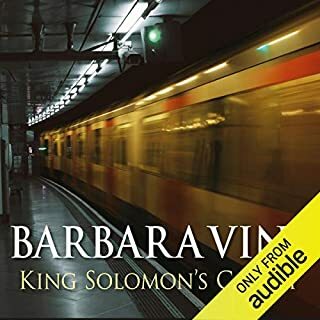 It is unfortunate to give such a quality novel and beautiful reading an average rating of three stars, as the previous reviewer did, on a point which will be irrelevant to most listeners. One of the best Barbara Vine stories read with feeling. If I could give this book 10 stars I would - what an amazing story, and so well read - I usually prefer male narrators, but Harriet Walter (an amazing actress!) does this justice, and more. Because the story is so long I HAD to put it down, but would have much preferred not to... Highly recommended. I found the pace and tone relaxing. The story is a mystery but also a sensitive examination of human emotions and the complexities of life. I bought this after listening to Dark Adapted Eye, which was amazing. This is good but you struggle to identify with the eponymous Asta. Would you ever listen to anything by Barbara Vine again? Have you listened to any of Harriet Walter’s other performances? How does this one compare? If you could play editor, what scene or scenes would you have cut from Asta's Book? When I read a book I get a strong feel for whether it is intelligently and carefully written. I have an open mind and love to find the best in a book but this one gave me bad feelings all the way from the beginning until half way through when I returned it to audible. It has a poor quality feel full of trite remarks and cliches; in particular the diary, despite the best efforts of poor Ms Walter, didn't feel at all authentic. Having read this a couple of times via paperback I was interested in how it would translate to audio. Firstly, it's basically a very long book and the first ten chapters or so are very *slow* indeed and if I hadn't been aware that it would improve then I would have given up on it. It did get much more exciting, although and the central character F Asta was interesting, if selfish and unpleasant. Both Swanny and Ann were less well-rounded though. Harriet Walter's narration was generally good, but sometimes her Danish accent went a bit Welsh! It all depends on if you can say r?dgr?d med fl?de. Harriet Walter has played Hedda Gabler in the past, so that may explain the Norwegian lilt but not the mispronunciation of Danish names and places. It wouldn't matter so much if there weren't lots of references to the language in the book. I expected better from such a good actor. 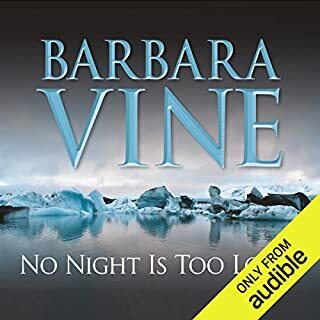 This is Barbara Vine at her best and it's unabridged. It should have been an all time favourite, (especially for someone with Danish roots) but I can only give it 3 stars. If you don't know Danish from Dutch and it's all Scandiwegian to you, then it won't matter and you can get on with enjoying the book.